Create Embellish Adore: GO PINK! with Chocolate!!! • MY M&M’S® will donate 10 percent of the sales of its “Promise Blend” to support the cause. The pink and white M&M’S® Milk Chocolate Candies, are pre-printed with the Susan G. Komen for the Cure "Running Ribbon" logo and a "for the CURE" message. Consumers also can create their own blend to send personal messages of support to friends, family and loved ones. The “Promise Blend” is available exclusively online at www.mms.com. • Limited-edition dark- and light- pink M&M’S® Milk Chocolate and M&M’S® Peanut Milk Chocolate Candies will be sold nationwide in stores in September and October. Both varieties are available in 14-ounce and 21.3-ounce bags. • M&M’S® Racing is lending its support on the NASCAR track by featuring a limited-edition paint scheme on the M&M’S No. 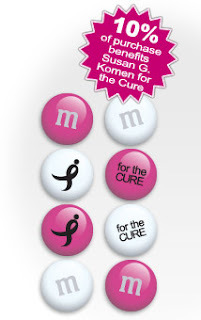 18 Toyota showcasing pink M&M’S® chocolate candies and the Susan G. Komen for the Cure logo. Current NASCAR Sprint Cup points leader Kyle Busch will hit the track in the specially-themed pink car during the Bank of America 500 race on October 11 at Lowe’s Motor Speedway in Charlotte, N.C.
WHO DOESN'T LIKE M&M's anyways... they have so many flavors now!